According to an article in M & C here, UNESCO has called for Libyan and allied forces to protect six specified historical sites in Libya. 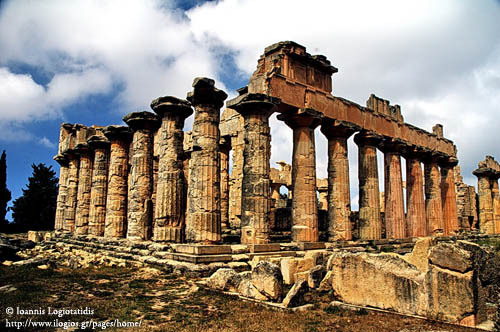 Libya’s sites on the World Heritage List include the archaeological site of Cyrene, which was established as a Roman province in 74 BC; and the site of Leptis Magna, which was founded in the first millennium BC. Cyrene is located near Al Bayda in eastern Libya. When Jesus was being led to the place of crucifixion, Simon of Cyrene was compelled to bear his cross. He was the father of Alexander and Rufus, to people apparently known to Mark’s audience (Mark 15:21). The fifth station of the cross along the traditional Via Dolorosa in Jerusalem marks the spot where Simon took up the cross. Photos of the Catholic chapel at the spot may be viewed at Holy Land Photos here. Just search for Cyrene. Or check the photos at Bible Walks here. Jews from the district of Libya around Cyrene were present in Jerusalem on Pentecost (Acts 2:10). Some men from Cyprus and Cyrene were responsible for the first preaching to Gentiles at Syrian Antioch (Acts 11:20). Lucius of Cyrene was one of the prophets or teachers at Antioch (Acts 13:1). Galen Frysinger has a collection of older photos of Cyrene on his website here. 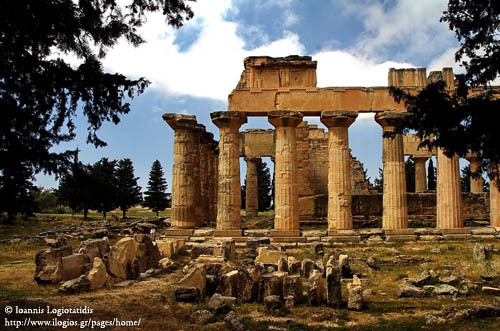 Ioannis Logiotatidis has some of the best photos I have found for Cyrene. He has kindly granted permission for me to share a couple of these with our readers. Both of are the Temple of Zeus. This temple was built originally in the 5th century B.C., but has been destroyed and rebuilt several times over the centuries. Temple of Zeus at Cyrene, Libya. Photo by Ioannis Logiotatidis. Check out more of Ioannis’ newer artistic photographs at his web site here. You may notice a strong resemblance between this temple and the Temple of Apollo at Corinth. Tom Powers, a guide in Israel, has written two articles about the ossuary for BAR. You may access them here. He concludes in the second article that this ossuary could be the ossuary of both Alexander and Simon. Another article about ossuaries and Jesus contains photographs and a brief mention of the Alexander-Simon ossuary. Click here. Libya is not mentioned, but the Syrtis is mentioned in the account of Paul’s voyage to Rome. You will notice that the Syrtis Major and the Syrtis Minor are located on the Mediterranean coast of Libya. This was a dangerous place for a ship in a storm. Gordon Franz recently posted an article asking “Why were the sailors afraid of the Syrtis Sands?” here. 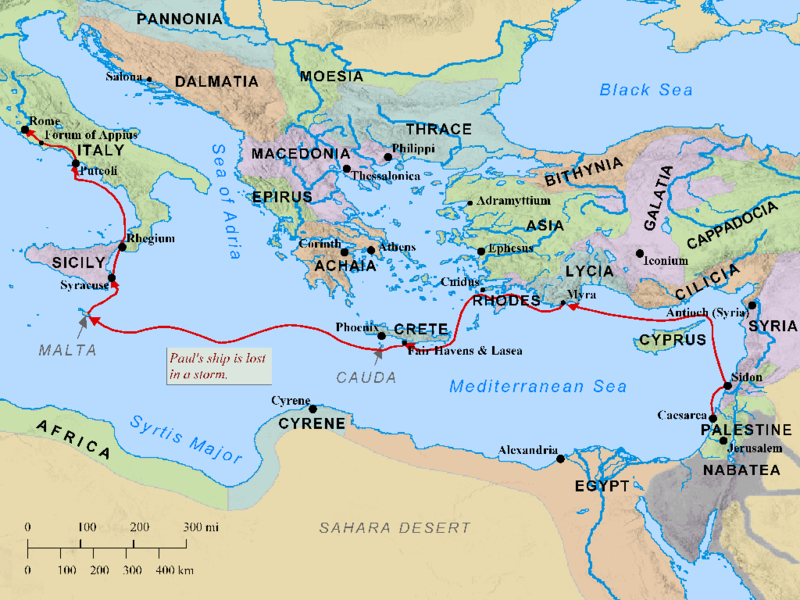 Paul's Voyage to Rome. Map by BibleMapper. This entry was posted in Archaeology, Bible Places, Bible Study, New Testament, Travel and tagged Libya, Roman Empire. Bookmark the permalink. Let’s hope both sides respect the request!